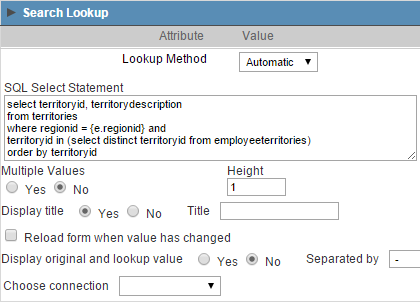 This example covers the development of a search application using the Ajax field reload. 2. 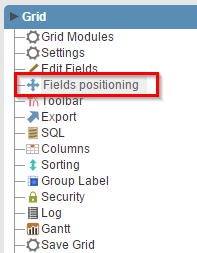 Select the Fields Positioning option in the application menu and choose U.EmployeeID, E.LastName, E.FirstName, E.Title, E.BirthDate, E.HireDate, E.RegionID, U.TerritoryID and E.Country fields. 3. 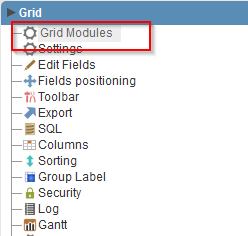 Open Grid folder and click in Grid Modules. 4. Set the Search as the initial module. 5. 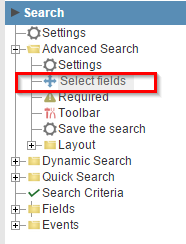 Open the Search folder and click in Advanced Search >> Select Fields. 6. Choose E.RegionID and U.TerritoryID fields. 7. 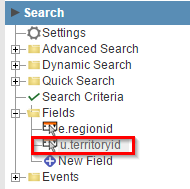 Open U.TerritoryID field, in search fields. 8. Change Data Type attribute to Select. 9. 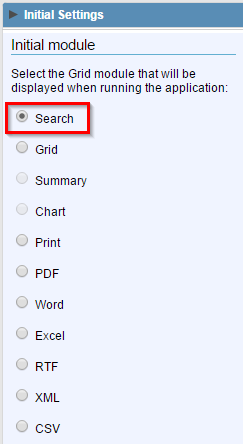 Open the Search Lookup block and configure the settings according to the image below. 10. 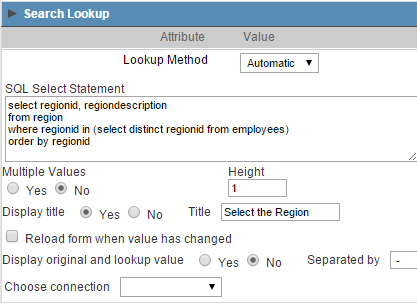 Open E.RegionID settings, modify the Data Type attribute to Select configure it as following . 11. Open the Ajax Processing block and mark the option “Use AJAX to reload…”.